The Philip L. Wright Zoological Museum (UMZM) is a natural history museum located at the University of Montana. UMZM is the largest zoological collection in Montana and serves as the principal repository for important bird and mammal state records. The museum provides important resources for research, teaching and educational outreach. 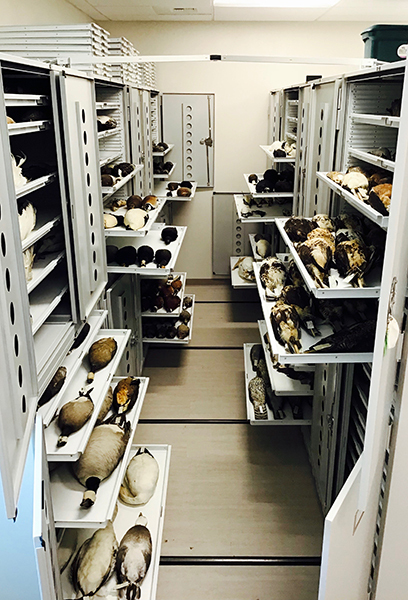 UMZM contains over 22,500 specimens of birds and mammals; this includes excellent representation of vertebrate biodiversity in the Northern Rocky Mountains, as well as unique special collections from around the world. In addition to study skins and skeletal material, the museum has a growing number of tissues and photographs. UMZM was started in the 1897 with the arrival of the first biology professor hired at University of Montana, Dr. Morton John Elrod. The oldest modern specimens in the collection were part of Dr. Elrod’s original Ornithology teaching collection and date back to 1880. The museum grew rapidly in the 20th century, with much of the success due to Dr. Philip L. Wright (right), who became curator in 1939. Dr. Wright contributed specimens to the museum via his active research program, by providing field experiences for UM students and through his meticulous documentation of bird and mammal biodiversity in Montana; in recognition of these efforts, the museum was named after Dr. Wright in 1997. Other significant contributors to UMZM include: mammalogist Robert S. Hoffmann, later Secretary of the Smithsonian National Museum; bear biologists John and Frank Craighead; mammalogist Bart O’Gara, mammalogist Kerry R. Foresman, author of “The Mammals of Montana,” and many more people. The number of modern specimens in UMZM continues to grow through the donation of salvaged animals as well as donations from Wildlife and Biology researchers at University of Montana, the Montana Natural Heritage Program, and Montana Fish, Wildlife and Parks.